Heh, watch the high res scans pop up sometime...oh well, at least then I can compare and improve my vector. I think you did a excellent job with this one! Lacus is beautiful as she always is, keep up the great work! Very clean vector! I like all these SEED pics with them in normal clothes. Im amazed, you vectored that from a small pic! 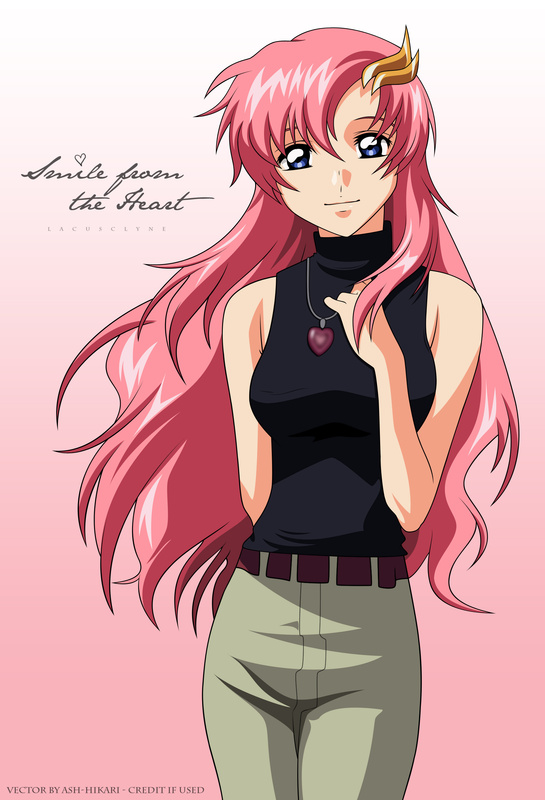 Don't apologize for vectoring Gundam Seed and Lacus and pink hair...you'll make the rest of us who love your said vectors feel bad! LOL! Anyway, I'll forgive you if it helps. The new lines aren't really that much thinner but I personally think it looks much better. Makes it look more like an actual scan to me now; whereas the fat lines really shout out "vector", you know? Ordinarily this image wouldn't be hard to vector. Lacus has a nice straight posture and she's all there (compared to your last Meer vector). Most difficult thing I imagine would be her hair (and the new thinner lines really look great on it, BTW). You deserve much praise for vectoring such a small source scan though! Like most others my eyesight would have failed long before I even attempted to do anything with it. And you've restored it to scan quality! I'm sure it'll be months (if ever) before we see the actual scans here. And yet you've provided one already. So thank you for a job well done and keep up the good work. Take care! I've never seen the scan before (that's what caught my eye X-P ) It's so small! But you did great! I love the vector! the lines are clean and the coloring is great too. Don't apologize for doing a lot of Lacus vectors. I love Lacus! She looks very cute and normal here. Kyaaaaa...such a kawaii and pretty picture of Lacus! I just love this one! Once again, a beautiful piece of work! I like it very very much!